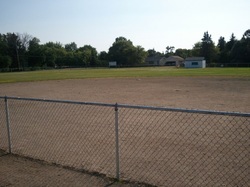 The softball diamond is located on the north edge of Leeds and is maintained the by Leeds Park Board. In 2011, a Minnesota Twins Community grant was secured and all the fence was replaced. The softball diamond has modern restrooms and a concession stand. The park board organizes a youth baseball program each summer for ages 4-12. There are three levels of play: Tball, PeeWee, and Midget. An adult softball team also uses the diamond for practices and games. Baseball and Softball games usually start at 5pm or later, so stop by after work to check out the action!